The Beatles were an English rock band that formed in Liverpool in 1960. With members John Lennon, Paul McCartney, George Harrison and Ringo Starr, they became widely regarded as the greatest and most influential act of the rock era. Rooted in skiffle, beat and 1950s rock and roll, the Beatles later experimented with several genres, ranging from pop ballads and Indian music to psychedelia and hard rock, often incorporating classical elements in innovative ways. In the early 1960s, their enormous popularity first emerged as "Beatlemania", but as the group's music grew in sophistication, led by primary songwriters Lennon and McCartney, they came to be perceived as an embodiment of the ideals shared by the era's sociocultural revolutions. All songs written by John Lennon and Paul McCartney, unless noted. She's so glad she's telling all the world. My love don't give me presents. Only ever has to give me love forever and forever. Foolin', I know she isn't. Got a good reason for taking the easy way out. She was a day tripper, a one way ticket yeah. It took me so long to find out, and I found out. Based on a novel by a man named Lear. When the rain comes they run and hide their heads. It's a love that had no past. Please please me oh yeah like I please you. P.S. I love you, you, you, you. I'm in love with you, ooh-o-ooh. Yeah that's all I... gotta do. It's you, you you you - oo-oo - oo-oo. ‘Cos when I get you alone, You know I feel okay. And I do, hey hey hey, and I do. 'Cause I've been in love before. I don't want to kiss or hold your hand. There is really nothing else I'd rather do. The things we said today. Because I told you before, oh, you can't do that. I saw you walk in your door. I nearly died, I nearly died. And I've lost someone who's near to me. For tomorrow may rain so I'll follow the sun. And I hear them say. Hey, you've got hide your love away. She's going to change her mind. You're going to find her gone. She's just the girl for me and I want the world to see we've met. Baby, you can drive my car, and maybe I'll love you. That was so hard to find. If you won't see me. And go where you're going to. It's so fine, it's sunshine. Was she told when she was young the pain would lead to pleasure? Or I won't know where I am. Hide your head in the sand little girl. That's the end'a little girl. Changing my life with the wave of her hand. There, running my hands through her hair. Both of us thinking how good it can be. I know I need never care. But to love her is to need her everywhere. Knowing that love is to share. And your bird can sing. But you don't get me, you don't get me. You want her, you need her. And yet you don't believe her when she said her love is dead. I didn't know what I would find there. Another road where maybe I could see another kind of mind there. Relax and float down stream. That Sgt. Pepper taught the band to play. I'm gonna try with a little help from my friends. The teachers who taught me weren't cool. A little better all the time. For so many years. Bye, bye. Late of Pablo Fanque's Fair - what a scene! About the space between us all. Lovely Rita meter maid, nothing can come between us. When I caught a glimpse of Rita. Heading for home you start to roam then you're in town. And you're on your own, you're in the street. Roll up for the Mystery Tour! Dying to take you away - take you today. ‘Cause I'm going to Strawberry Fields. Of every head he's had the pleasure to have known. Nothing you can say, but you can learn how to play the game. I'm back in the U.S.S.R..
You don't know how lucky you are, boys. If looks could kill it would have been us instead of him. Happiness is a warm gun mama. I know nobody can do me no harm. Because happiness is a warm gun mama. Hold your head up you silly girl look what you've done. Help yourself to a bit of what is all around you. Where I stop and I turn and I go for a ride. Get to the bottom and I see you again. You tell me that it's evolution. Don't you know it's gonna be all right. Or if my hair is brown. Cause he's so hard to see. You know I believe her now. Well you know I nearly broke down and cried. Well you know I nearly broke down and died. Oh what joy for every girl and boy knowing they're happy and they're safe. I'd like to be under the sea in an octopus's garden with you. Little darling, it seems like years since it's been clear. Here comes the sun, here comes the sun. You only give me your funny paper. I only give you my situation. Longer than the road that stretches out ahead. Everything has got to be just like you want it to. Through my open views inviting and inciting me. Still a chance that they will see. We knew that America would make us or break us as world stars. In fact, she made us. Beatles' manager Brian Epstein, Pop Chronicles: Show 29 - The British Are Coming! The British Are Coming! : The U.S.A. is invaded by a wave of long-haired English rockers. Part 3, 1964, aired 1969. 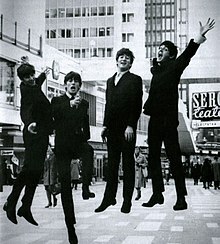 The Beatles were so big that it’s hard for people not alive at the time to realize just how big they were. There isn’t a real comparison with anyone now. I suppose Michael Jackson at one point, but it still doesn’t seem quite the same. They were so big that to be competitive with them was impossible. I’m talking about in record sales and tours and all this. They were huge. They were bigger than Jesus! This page was last edited on 30 July 2018, at 23:06.